Time flies like a whirlwind and before even I realized,it is the 7th day of the month,the day when we post our selected recipe chosen by A Sweet Punch hosts[aka yours truly,Maria & Ria].But this time there was a twist!We did not choose any recipes,instead asked all the members to bake something of their choice and we can't wait to see what everyone else is baking this month,what fun! I baked these Nankhatais a while back.Some times,my bakes are meticulously planned[keeping in mind the intake of butter,sugar etc]but sometimes they happen in a flash.Just like this one.It was on a lazy afternoon I saw Raaga's Fb status message with a link to her recipe for Nankhatai and I was intrigued.I mean,I have seen that post before,she had mentioned how her mom's Nankhatais were quite popular with her friends.But the time to bake it had finally come.More so because I had a bottle full of ghee with me[which is a rare occurance].I didn't waste any more time and immediately hopped into the kitchen to make it. Half way into the baking,I knew[I just knew it] that this was IT.My search for THE perfect Nankhatai could be laid to rest coz it smelled wonderful.Perfect looks too,with the slight crack on top,I just couldn't wait to take my first bite.And when I did,I just couldn't stop--it is that good.Try it for yourself and see!! Cream the sugar and the ghee until well blended. Sift the flour with the soda. Add this to the sugar-ghee mixture. Add the cardamom and nutmeg powders. 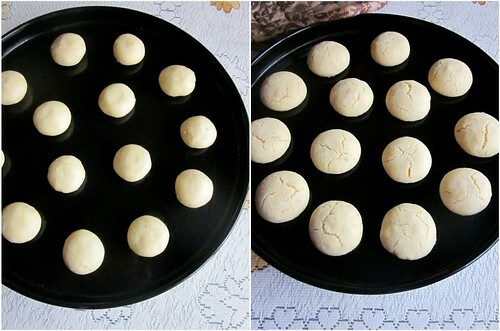 Make a dough and divide into small balls. Flatten each ball onto a cookie sheet and bake for 20 minutes at 180 C.
How did we like it - As I said,I'd never look for another Nankhatai recipe again coz this one works like a charm.Raaga says this is a halved recipe,so this one can be easily doubled for a bigger batch--and you'd need a bigger batch to satisfy your cravings.We immediately shared this with some friends for the fear that we'd finish it all by ourselves! Perfect nankhatai's..looks just like the bakery bought ones..love the white biscuits on black tray. I am a simple housewife from Chennai.I have never baked in all my life. I have been a silent reader of your blog for a while and really love your blog. I understand you live in chennai in that case could you please inform me where I can find the baking tins and trays. I have IFB oven with convection mode. Very addictive and adorable nankhatais.. Perfect Nankhatais, Divya. Ideal with tea. Absolutely stunning! 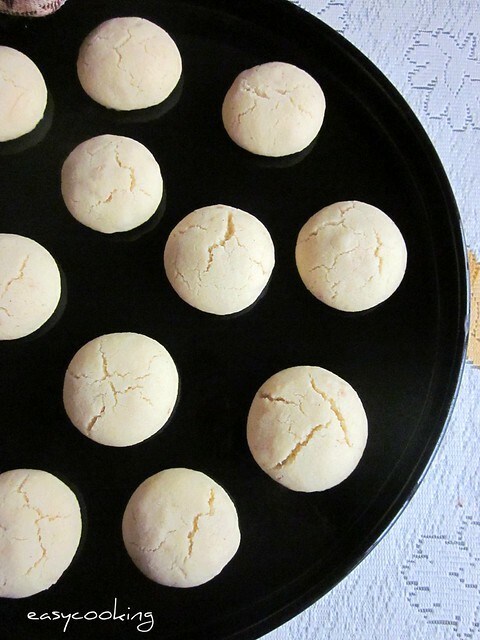 Nankhatai looks just perfect! Just drooling over that delicious nankhatai,simply inviting.. They look perfect and cute. My all time fav. Anything you bake should always be done in big batches. Now only if I could get my share in that big a batch. These look awesome! This recipe didn't work for me. I put the same amount of ingredients specified by you. As a result, I had a very crumbly dough. I am not sure if it should be a soft round ball or if we have to make balls from a crumbly dough. I don't think it's specified in the recipe. I referred to your other recipes where you had a soft dough in your Khare biscuit and hence thought that's how this should be, for which I had to add much more ghee than you specified. I made rounds ad put it on my cooking sheet and wintin 3 minutes, I had the ghee oozing out and the cookies flattening and getting bigger by size and burning in 5 minutes without getting baked. Did u use icing sugar instead of castor sugar or did u perform frist step carefully? Hi Meghana,I am not sure what went wrong.The amount of ghee for this recipe is just right for the amount of flour and the dough comes together very beautifully.It shouldn't be crumbly,it forms a soft ball of dough.Probably you can make out from the before baked photo of the cookies.Did you use thick ghee or melted ghee?This has been one of the foolproof recipes I've tried,so I am sorry if it didn't come out great for you. landed right here after a google search for nankatai recipe :) i am zeroing down this one and have bookmarked. how would you rate the both recipes? which one is a step more recommended, divya? 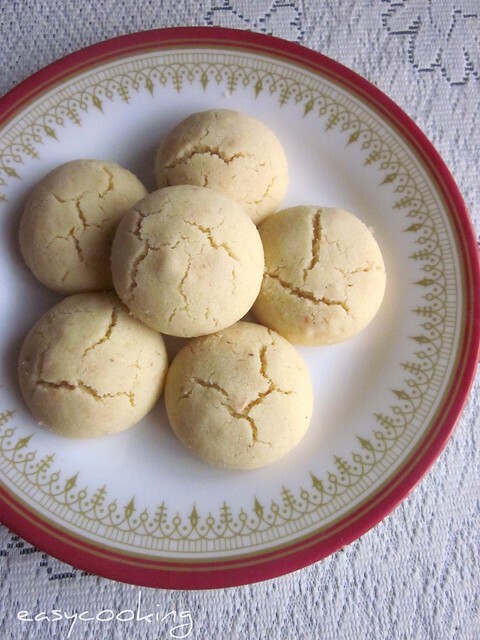 Hi Divya,i am new in ur blog....amazing blog!...keep it up and i have to share 1 thing ..i tried ur nankhatai and it came out very well...Thank u soo much dear! I am going to try your recipe this weekend. We bought some nankhatai and my one year old daughter loves it. so promised to make some for her and have found your recipe. Thanks for sharing. will let you know how it turns out. ooo...la..la.., i baked them today. thanxs divya for such a lovely recipe . 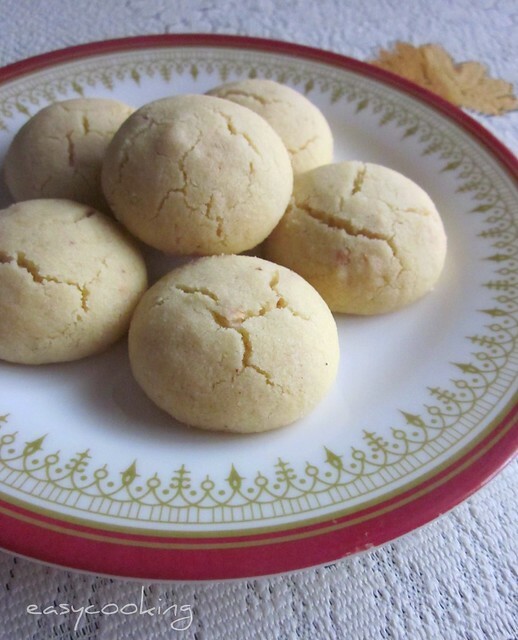 Love the simplicity of your recipe for nan khatai but I don't know what amounts of ingredients to use in grams. I don't know what a cup equals to in grams. Please can you let me know as I would like to try your recipe todsy.